EAS soft Labels protect: books, jewelry, accessories, bottles, and boxed items, and any other small or hard to tag products. The 4x4 RF label is the most popular size EAS label, great for any product where a hard tag will not be sufficient. Security label has a fake barcode printed on it to simulate inventory stocking items. 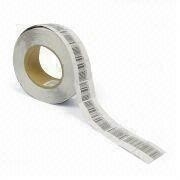 The bar code labels use a strong adhesive to stick to products. Copyright © 2012-2019 Bargains Way. All rights reserved.